Today’s guest post is from my friend and former colleague at Norcross High, Dan Byrne. Both Dan and his wife, Dr. Melinda Byrne, are accomplished teachers; Dan was our Teacher of the Year at Norcross HS for 2014-15, and Melinda was one of the finalists for the same award this fall. Collaborative efforts with Dan were featured last year on the blog, and I am delighted he is continuing to integrate pieces of that work with his students. Earlier this semester, Dan listened to his students and their points of need by modifying the large group write-around strategies we had done in 2014-2015. Here are his reflections of that process! I teach IB History to highly motivated juniors and seniors. By highly motivated, I mean the kind of students who will read six chapters the night before a test just to make sure they feel confident. IB History is different than many subjects because it rewards a high level of conceptual thinking that is paired with their choice of very specific facts that back up their concepts. That is why I like “Write-Around” as a strategy. I often give students a quote, an old IB test prompt, or even just a theme and have them add their ideas as they work cooperatively. I find this a non-threatening, fun, change of pace for students to review, build concepts, or practice skills of supporting or refuting ideas. Students initially walked around and responded just like a regular write around. However, they soon decided it was more efficient to pass them from desk to desk, so they passed the sheets. (Like I said earlier, the challenge was the amount of information they had in their heads). In my smaller classes, students worked in pairs; in larger classes, students worked in groups of four. Students were writing significant ideas/themes/facts for aspects of WWI. The kids wanted this information/ideas to keep for review after class ended. Students then engaged in small and whole group discussion. After the class discussions, students “starred” the comments from the write-around they felt were notable, exemplary, or important in some way. Once students had completed the activities , I copied their Write-Arounds so each student could have a packet of copies of their peers’ responses. Students liked the Mini Write Around because they felt “less pressured” to get all the information down (sometimes these kids lose the forest for the trees). They also liked that the paper fit on a standard desk. We were also able to have more “writing stations” than we would with the traditional write-around. 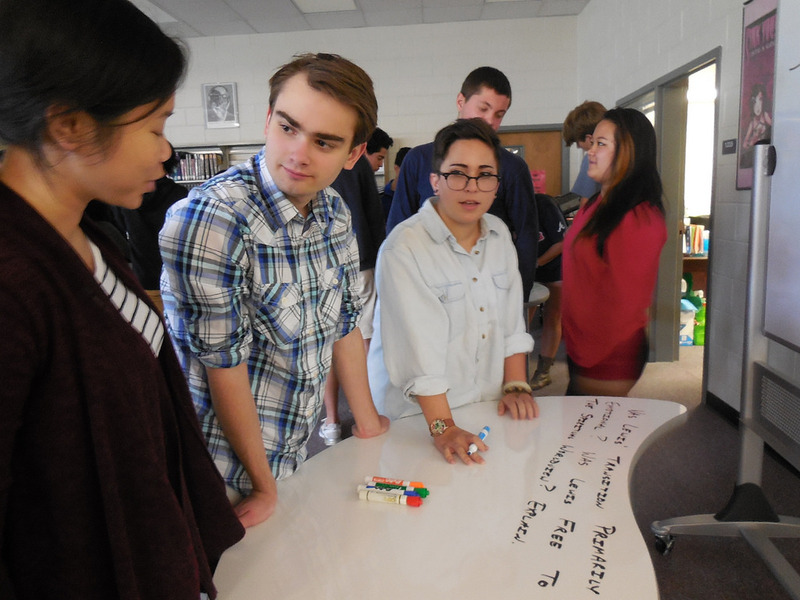 The only drawback was that some students remarked that they didn’t have enough space to develop their ideas. My main complaint about this modified approach was that students got very “facty” on this assignment. I think this was partially due to the paper size and partly due to the fact that I did not have good prompts for them to build concepts around. I think another strategy to try would be to provide students with the opportunity to spend time taking notes at the end of the activity. That would force them to distill the ideas on their own rather than depending on me to give them a shotgun approach. Another modification for the future: groups of writers need to be smaller so everyone can see the paper; I also feel that three is the ideal size for my kids so that you have enough to generate discussion but not so many that they are butting heads. I also need to give them more time to write (I think I thought, “less paper, less time”). Last but not least, the students need to write in ink so the copier clearly picks up what they wrote. How are you all integrating and modifying written conversation strategies to meet your students’ needs? Please share your experiences and variations in the comments below! In yesterday’s post, I wrote about our most recent collaboration with Dan Byrne and James Glenn and on a larger scale, the possibilities for libraries as places and catalysts for growing academic literacies. Dan was gracious enough to stop by for a few minutes this morning to share some quick but poignant reflections on growing a culture of learning with students that supports academic literacies. 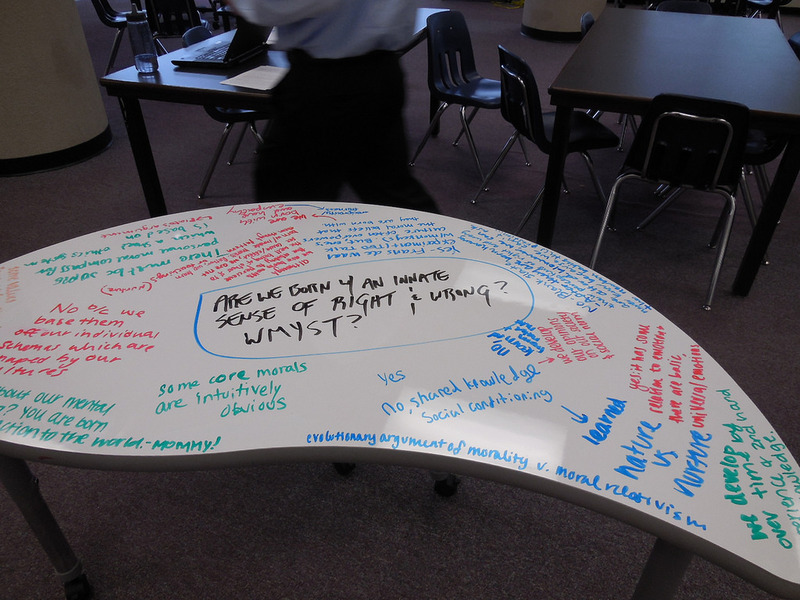 Yesterday I blogged about the use of our new markerboard surface tables as a way for students to collaborate and capture their group thinking. 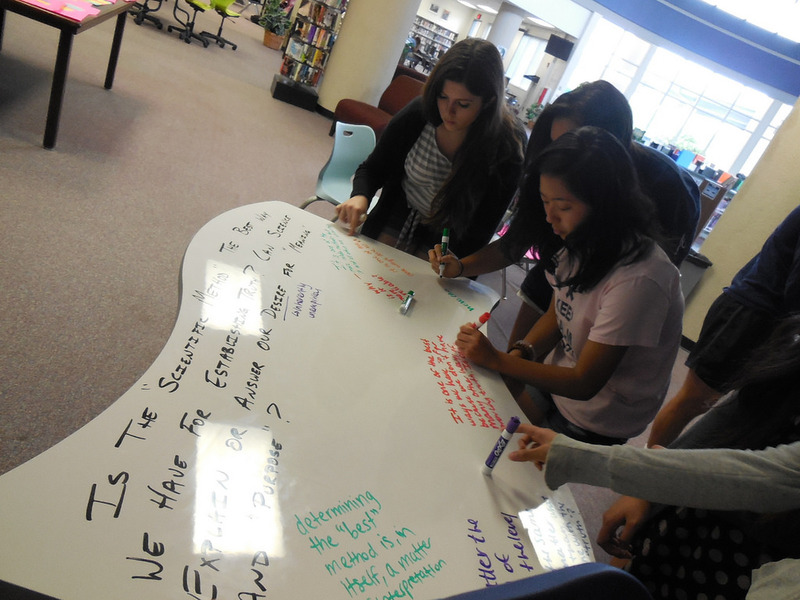 I’d like to briefly share another use of these dry erase surfaces in our library learning studio from last week with our Theory of Knowledge (TOK) students. This was an activity that came together very quickly Thursday morning and while not tied to a formal research project, threads of inquiry were essential to the learning experience. The group came to the studio to watch a short clip of a PBS video related to their content/unit of study. 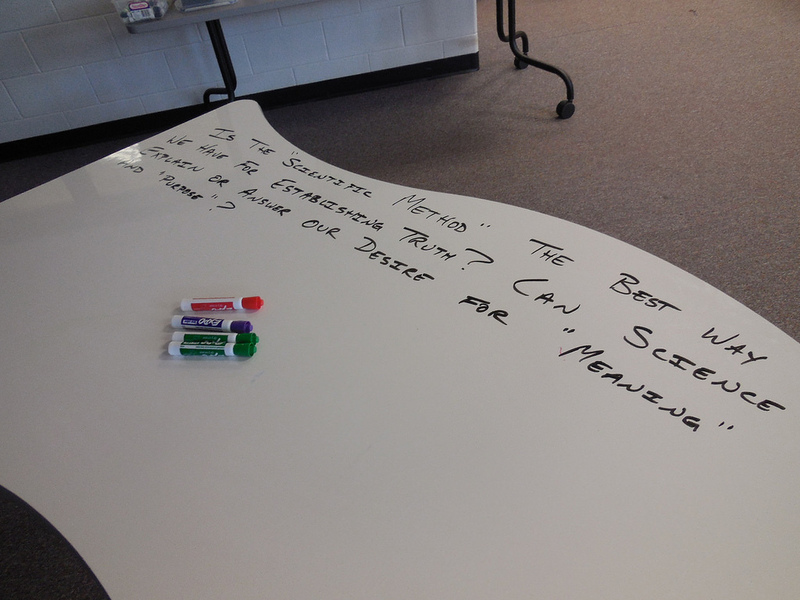 Dr. Glenn and Mr. Byrne developed discussion questions around this segment and composed them on our dry erase surfaces. 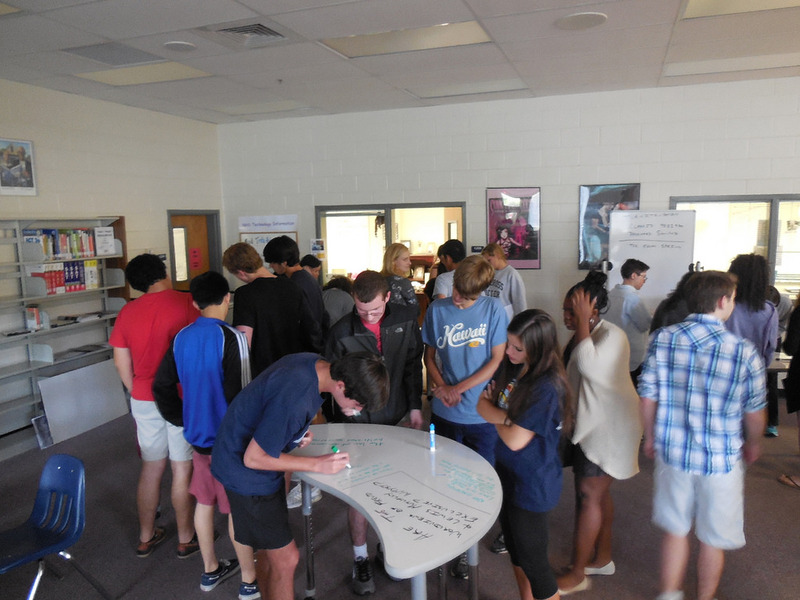 After watching a short segment of the video, students had approximately 10-12 minutes to visit each table; students were encouraged to discuss their thoughts and reflections with their peers and then jot down their responses. We also observed students continuing the conversations around the written responses as they engaged in some truly meaningful and deep dialogue with each other. 1. Disciplinary literacy: “…the join understanding of discipline-specific literacy features through which knowledge is created and practices are shared” (Kiili, Mäkinen, and Coiro 225). 2 Argumentative literacies: “As students work to establish themselves as contributing members of a domain-specific discourse community, argumentative literacy practices enable them to consider alternative perspectives, broaden and deepen their knowledge, and make judgement to inform their decision making. As a result, students are able to identify, evaluated, and produce arguments within a wide range of individual and social literacy events…students are able to effectively composed, evaluate, and learn from arguments by adopting the social practices of the target discipline” (Kiili, Mäkinen, and Coiro 225). 3. Collaborative literacies: “…those literacy practices in which two or more person engaged in reading and/or writing together are equally responsible for negotiating meaning through talk. The goal of collaborative literacy practices is to produce a joint interpretation of a text” (Kiili, Mäkinen, and Coiro 225). In this case, our texts were previous knowledge and the PBS video segment. 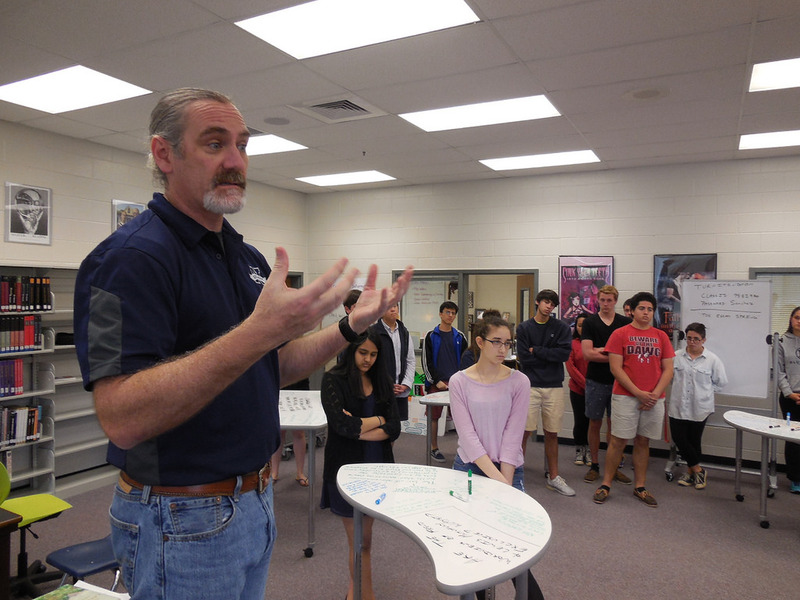 We then moved to a large group discussion facilitated by Dr. Glenn; students from each table had the opportunity to share their thoughts about the question posed at their table. Because we ran out of time, the activity was continued into the next day. Many students captured the ideas on each table with their cell phones as they prepared to leave for lunch. While not a formal research type of activity or project, we love working with teachers and students to provide them space and assistance for these kinds of learning opportunities. So often we call the library the “biggest classroom” in a school, yet learning experiences are often limited to formal research projects and/or storytime. 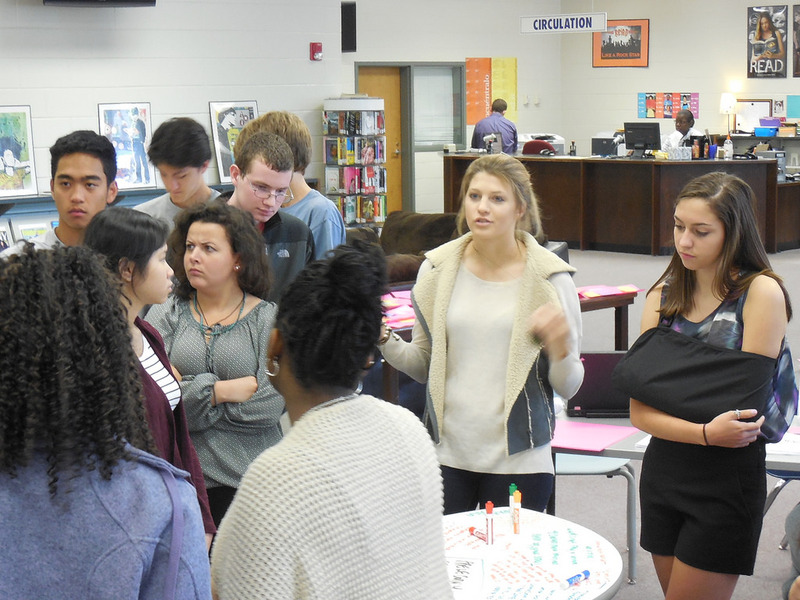 In many schools, it’s a challenge for teachers and administrators to see the library as an additional learning space that can accommodate many kinds of experiences because the quiet, book-centric model and/or prior experiences dominate their perceptions. In other school libraries, limited budgets and restrictive physical space hinder the efforts of librarians to sell the library as a studio and alternate kind of classroom. When our spaces are designed with flexible areas that can be repurposed quickly, mobile furniture, and technologies for multiple modes of learning (low tech and high tech), the library can support a more diverse range of learning experiences and be better positioned to support the growth of academic literacies for all students throughout the school year, not just when it is time for formal or informal research projects. These learning space design drivers expand the possibilities of libraries as sites of practice for multiple literacies and can potentially position the library as a “commonplace for interpretation” in exploring, expanding, and theorizing the literacy practices within its learning community (Sumara), hence shifting and expanding the role of the librarian as a sponsor of literacy (Brandt). Brandt, Deborah. Literacy in American Lives. Cambridge: Cambridge UP, 2001. Print. Kiili, Carita, Marita Mäkinen, and Julie Coiro. “Rethinking Academic Literacies.” Journal of Adolescent & Adult Literacy 57.3 (2013): 223-32. Professional Development Collection [EBSCO]. Web. 25 Apr. 2015. Sumara, Dennis J. Why Reading Literature in School Still Matters: Imagination, Interpretation, Insight. Mahwah, NJ: L. Erlbaum, 2002. Print. Note: If you are interested in the “Rethinking Academic Literacies” article, you may also enjoy teacher Gary Johnston’s series of blog posts on this article. Battledecks: It’s Not Just for Librarians! 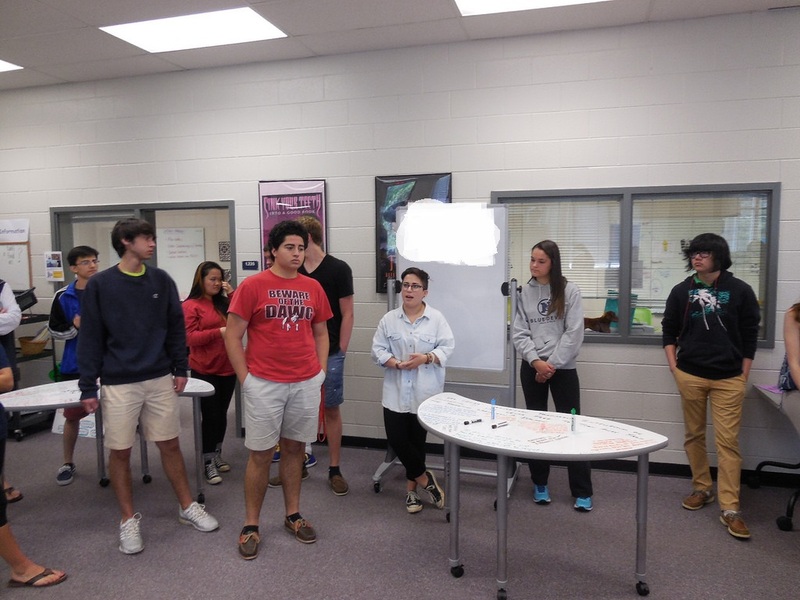 A few weeks, IB History of the Americas teacher and one of our regular collaborative partners Dan Byrne came to us with a challenge: he needed his students to research different nationalist movements and revolutions as well as present their findings to their peers. The dilemma? His students were suffering a severe case of early onset SENIORITIS. 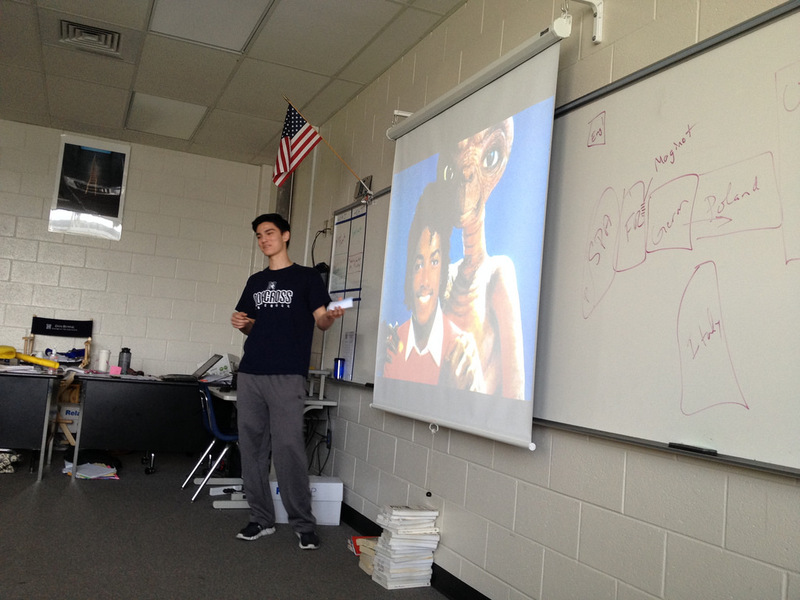 He needed a way to challenge the students with their presentation format and skills yet avoid crafting lengthy PowerPoints that were primarily an exercise in boring regurgitation. 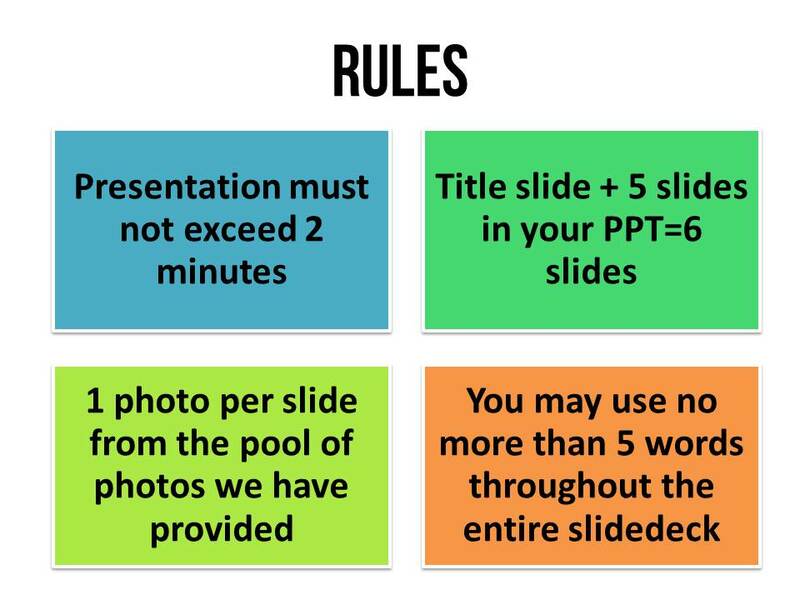 After some thought, my solution was a modified form of Battledecks, the legendary form of “PowerPoint Karaoke” that has been especially popular in library conference circles. Drawing on my own experience as a participant, watching others, and some great advice from fellow librarian Andy Woodworth, I pitched the idea to Dan. After some initial conversation, we worried a true Battledecks might be a little overwhelming for their first effort; in addition, Jen and I were worried about prepping slidedecks for three classes even though the presentations were going to be shorter than a typical Battledecks sesssion. After a little research, I found a modified version from teacher Tom Woodward that seemed to be the perfect balance of creative thinking and enough structure to push our students but not send them over a cliff. I decided to expand my photo pool (shared with students via Google Drive and the link was posted to Dan’s course page) to 45 images since I was worried presentations could get a little stale with a smaller photo pool for three classes. After explaining the purpose, guidelines, and a sample slidedeck with students, they were off and running. Because students had already distilled their research into a poster, they had a great starting point for pulling out the big ideas and details they wanted to convey through the image based slides. We also gave our students a little more prep time with two days total for introduce the concept, to craft slides, and to do a little individual rehearsal. On Day 2, students completed a quick reflection via Google Forms; this survey also served as a database to help me generate individualized scoresheets thanks to good old-fashioned mail merge. Finally, we gave the students the option of using a notecard if they needed a “safety net” to help them although we had quite a few who either used no notecards or who barely glanced at them because they had done such a great job creating their presentations and remembering the details based on the images they chose. We assessed students on a scale 0-5 in each of these areas and took notes as students presented. Students were also asked to jot down a few notes or a big takeaway for each presentation; Dan provided these feedback strips to students. Students presented over approximately 2.5 days; presentations were uploaded to the course dropbox in D2L, the district course platform, so students can download them and present easily for the most part. 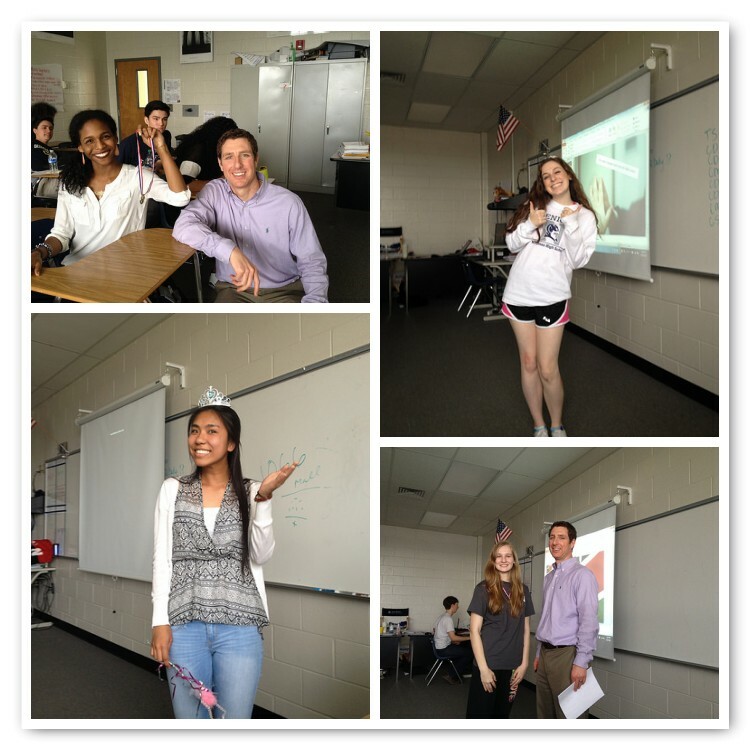 We drew for names, so the presentation order was random, and each period a student assisted us as official timekeeper. Overall, we were pleased with the work and performance of the classes as well as the atmosphere of support students gave each other. Each day we awarded a tiara and wand to the most interesting presentation from each class period. Other teachers who have heard about this activity are now planning on using this strategy as a way of having students jigsaw and share information. It’s a great presentation structure that is flexible and can be adapted as a formative or summative learning performance. We are looking forward to helping Mr. Byrne and his student stage an authentic Battledecks later this spring and sharing that with you.